Daisy Heart tatted in Lizbeth 20, "Pink Parade"
I only realised after I had completed the two-daisy center that I had missed a petal on the flowers - there should be 8 petals on each and I only have 7. But strangely, the whole thing worked out anyway and it still looks like the picture in the book so I'm not sure where I would have squeezed in the other petal! I think this would also look nice with the flowers in one colour, the leaves and stems in another and the surround in another. What do you think? 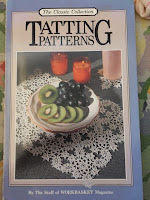 This is the book that the patterns came from. It is a reprint of patterns from Workbasket magazine. The blue snowflake motif is beautiful - as is this Daisy Heart. I love them both! I have to look for more Workbaskets . . . I like the idea of the flower/leaves & stems/surround in different colors - do you plan to try it? Would love to see it! Why is it when I look at the same books you do, I never see what you do? The blue motif is gorgeous and I love this little daisy heart. 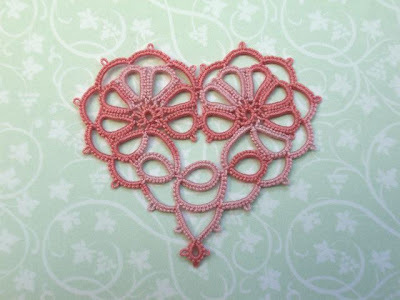 Plus your tatting is so lovely! Das Occhi-Herzchen sieht wunderschön aus. Thanks for the information you sent me. I went looking for the book, but it is WAY to high in cost for me to purchase it. I will try on my own to figure it out. Wish me luck. I like it the way you did it.